"There is in them a softer fire than the ruby, there is the brilliant purple of the amethyst, and the sea green of the emerald - all shining together in incredible union. Some by their splendor rival the colors of the painters, others the flame of burning sulphur or of fire quickened by oil." There is a giveaway with one of my very favorite etsians happening now...run, don't walk over the Xenotees blog and enter. The fabulously talented and business savvy Nicole of Lillyella is offering up one of her exquisite splendors to the lucky winner of the giveaway. Although I intend to win, I encourage you to enter as well. "These gems have life in them: their colors speak, say what words fail of." 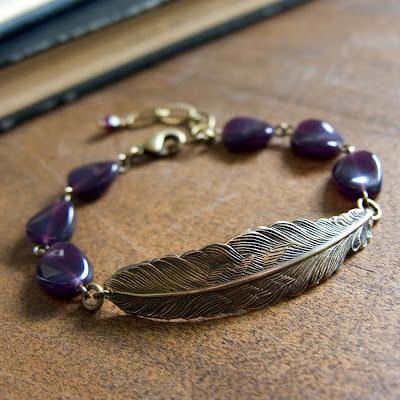 Image above is of the Starling Plume Bracelet available at Lillyells etsy shop. Photo ©Lillyella, used by permission of the artist.